Rudolph is the 5th in my "Ringing in Christmas" Ornament Series. 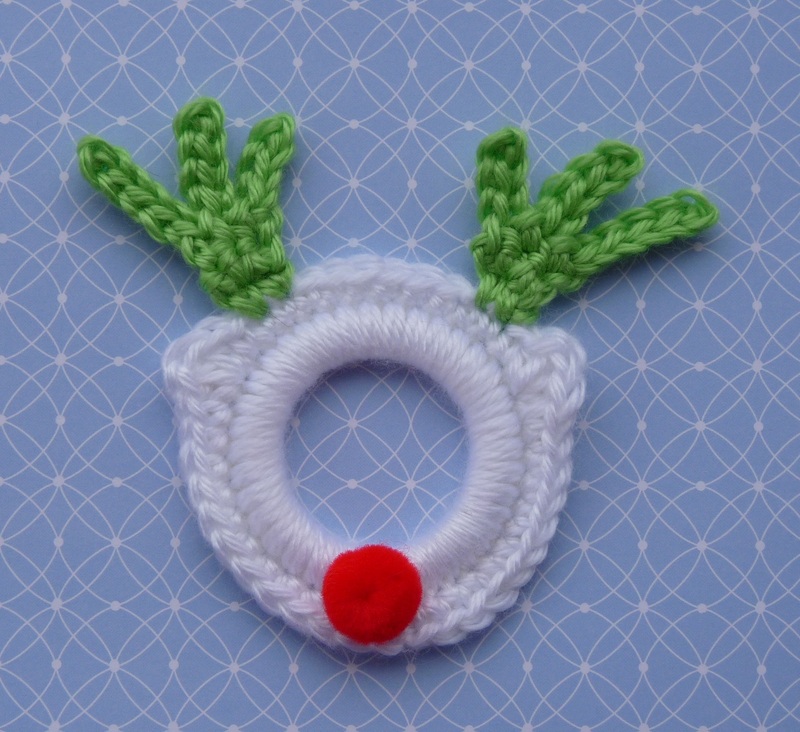 Each ornament is made by crocheting around a 2" plastic ring. Round 2) Ch 1, sc in same st and sc in next 10 sts, (hdc, dc, hdc) in next st (1st ear made), sc in next 12 sts, (hdc, dc, hdc) in next st (2nd ear made), sc in last 11 sts, join with a sl st to beg sc. Do not turn. (34 sc, 4 hdc, 2 dc) End off white, weave in ends. Row 3) Ch 6, sl st in 2nd ch from hook and sl st in each of the remaining 4 ch sts, then sc in the first sc st on row (1st antler point made), ch 5, sl st in 2nd ch from hook and sl st in each of the remaining 3 ch sts, then sc in next sc st on row (2nd antler point made), ch 4, sl st in 2nd ch from hook and sl st in each of the remaining 2 ch sts, then sc in last sc st. End off, weave in ends. Row 3) Ch 4, sl st in 2nd ch from hook and in each of the remaining 2 ch sts, then sc in first sc st on row (1st antler point made), ch 5, sl st in 2nd ch from hook and sl st in each of the remaining 3 ch sts, then sc in next sc st on row (2nd antler point made), ch 6, sl st in 2nd ch from hook and sl st in each of the remaining 4 ch sts, then sc in last sc st on row. End off, weave in ends. Finishing: Glue red pom pom at the bottom for the nose. Love it... you are on the roll with this!!! Thanks so much! I have made several of your ring ornaments and they are so easy, fun, and cute. I can't wait to see what you come up with next! This is another one of your never ending fantastic creations. ABSOLUTELY adorable!!! I plan on doing these in my group as our crochet a long this month. I will be linking to each one. I would love to translate your lovely pattern to Dutch and write a blogpost about it. Linking to your original pattern of course. Can you let me know if that's okay? 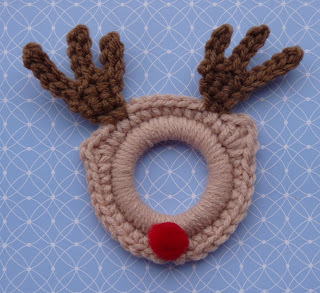 I think my Dutch followers would love to make some Rudolph's for Christmas. Greetings from Brigit from Holland. Have you ever made any Halloween themed ring ornaments?